Alexander Turney Stewart arrived in New York in 1823 from Lisburn, Ireland. He established a small dry goods store with lace and linens he brought from Ireland, purchased with inherited money. By 1848 his emporium was the largest in the world, with branches in other countries. At mid-century he ranked among the richest men in the United States. Although Stewart was generous with his fortune, he preferred not to simply donate funds, but to invest money into projects that would either earn profits for the charity or show tangible results. In the first years after the end of the Civil War he came up with an ambitious scheme. New York City was teeming with struggling women, many of them war widows, who were desperately trying to survive. Finding housing that was at the same time respectable and affordable was nearly impossible on the scant wages they earned. 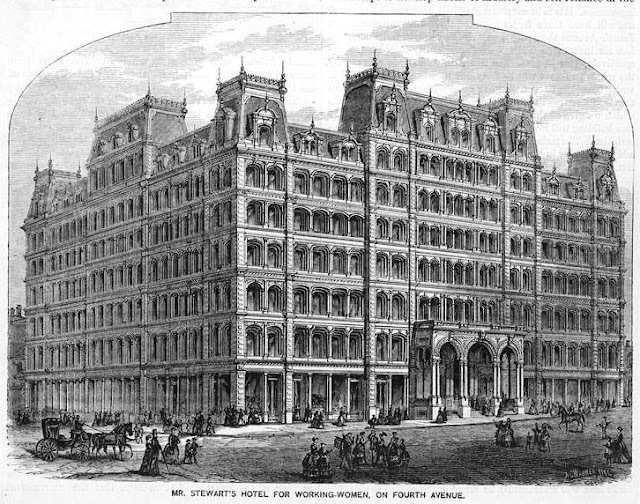 Stewart proposed building a magnificent hotel solely for working women. 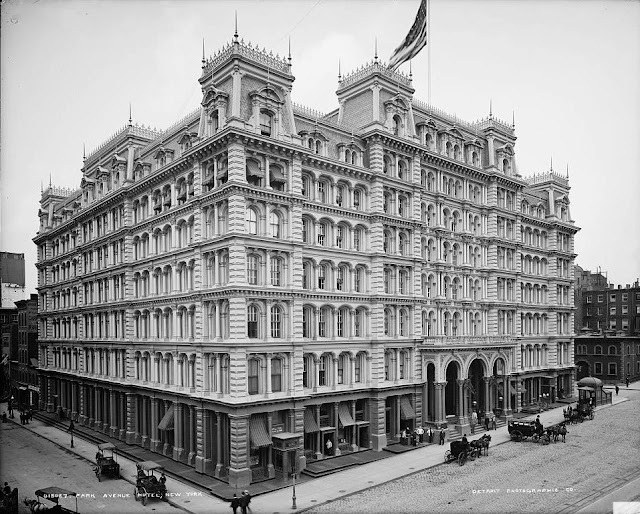 In 1869, the same year that his magnificent white marble mansion began rising on Fifth Avenue across from to Caroline Astor’s home, Stewart commissioned architect John Kellum to design the hotel. The choice of architect was simple: Kellum had not only designed Stewart’s impressive store on Broadway, but he was responsible for the French Second Empire mansion as well. 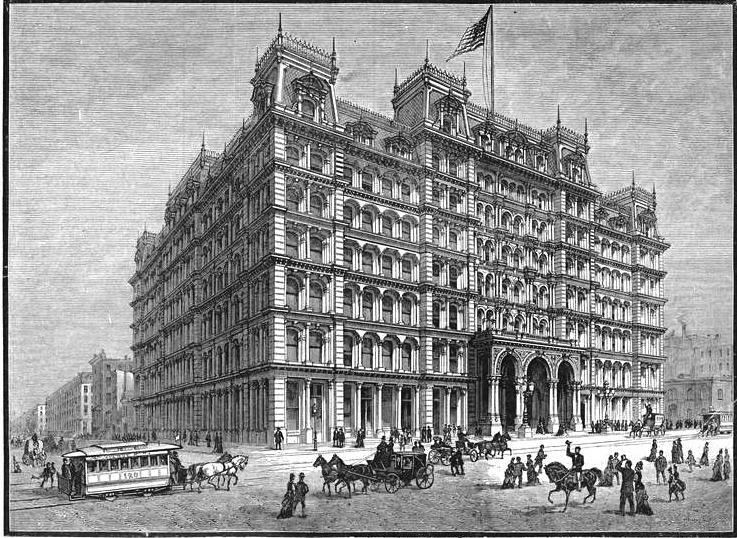 Spanning the entire block from 32nd Street to 33rd Street along Fourth Avenue, the “Women’s Hotel” it was intended to house as many as 1,500 women working in “daily labor.” Kellum turned again to the highly fashionable French Second Empire. His drawings appeared in periodicals in 1869 that displayed a magnificent cast iron structure of arches and colunettes, an impressive two-story entrance portico that jutted out onto the Fourth Avenue sidewalk, and a mansard roof of various heights crested with lacy cast ironwork. Stewart intended that his hotel be safe, morally upright, and clean. The women should live in a comfortable and upscale environment, despite their personal conditions. There should be a library, common areas for conversation and casual pastimes, a communal dining room and pleasant rooms. Unfortunately, neither Alexander T. Stewart or John Kellum survived to see the building’s completion. Covering 16 building lots and costing upwards of $3.7 million, the hotel dazzled. The ceilings were between 11 to over 19 feet high. There was hot and cold running water in every room, speaking tubes to the office, “easily available” toilets and baths. 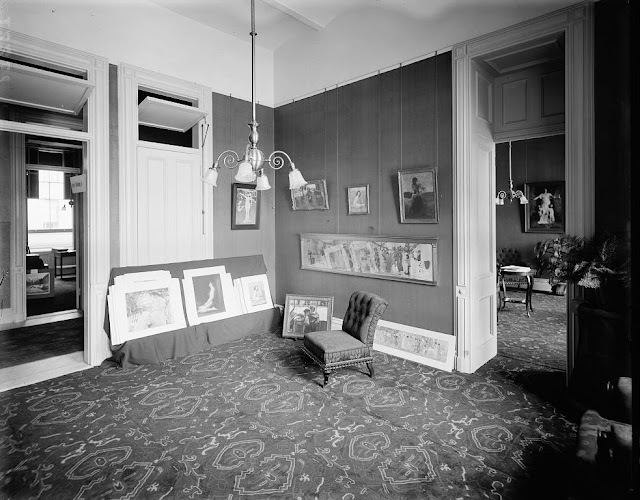 Stewart had personally selected the French plate glass for the windows, and the carpeting, fixtures and furniture were custom-made. Over 15,000 yards of Axminster, Wilton and Brussels carpeting were used. 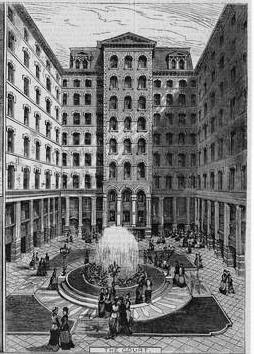 Kellum designed the building as a hollow square, in the middle of which was a lush Victorian garden with a goldfish-filled fountain. Retail stores fronted the sidewalks for additional income. 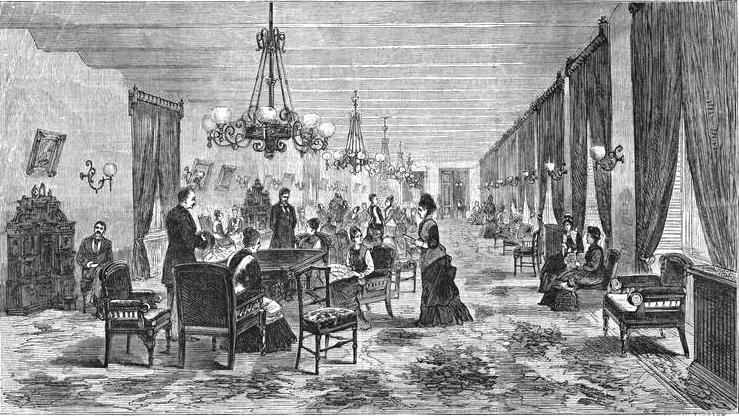 Along with the 502 sleeping rooms there was a 30-foot dining room (capable of serving 4,000 meals a day to 600 guests at a time), another room of the same size used for concerts and lectures and a library of 2,500 volumes. For $6 a week a woman shared a room with another working girl. For a dollar extra she could have a private room. Breakfast cost 35 cents, lunch 25 cents and dinner 50 cents. Any boarder could invite a lady friend to dine after procuring a ticket from the office. The list went on. Boarders could have no “dogs, cats, birds or pet animals of any kind;” baths were conveniently located to the rooms, but tickets to take a bath cost a dime. Applicants were required to supply written “satisfactory certificates or references as to character,” be employed and over 12 years of age. It would not be the case. Fifty-four days after the brilliant opening, Mrs. Stewart declared the hotel “a complete failure.” She pointed out that costs of labor (it cost $25 a month to feed and house the 40 waiters; the head cook earned several thousand dollars a year as did his four assistants; and the hotel was spending more than $500 a day in interest, taxes, water and gas than it was receiving in rents). There was no end to the opinions of why the hotel fell flat on its face so quickly. 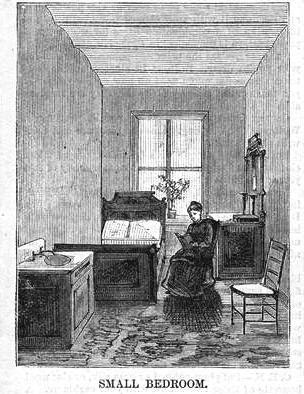 Some pointed out that the delays in opening meant that rooms were available in the Spring—but boarding houses demanded commitments from fall until summer so most “toiling women” were already obligated. Others said the room rates were too high; some that the expensive furnishings and carpets made the common women feel shabby. The list went on: the rules were too strict; women could not even bring a house plant into their rooms; the beds were too small. But Judge Hilton, who handled the failure, knew exactly what the problem was. Whatever the cause, Mrs. Stewart closed the hotel to do renovations necessary to reopen as a commercial hotel. The changes would include a smoking room, billiard room, and barber shop. Several retail spaces along 32nd street were closed off and converted into a barroom with a 38-foot bar backed by broad mirrors. Intended for guests only, it could had no street entrance. The other stores along 32nd Street were transformed into a series of dining rooms connected by arches capable of seating 324 persons. Balconies and additional stairs would give greater access to the courtyard which “will undoubtedly be the favorite lounging place of the new guests,” according to Judge Hilton. A large iron balcony, 20 feet wide, encircled the courtyard at the second floor “for promenading and lounging.” It was designed so that it could be protected by glass in the winter, making it useful year-round. Twenty years later a stray ember would prove that wrong. The guests panicked as the hallways filled with smoke and “charged” through the hotel to the exit stairs. They found them padlocked. Fire investigators described the stairways as “fire-proof brick shafts” which would have provided safe egress to the guests. Instead, twenty-one people burned to death in the corridors of the Park Avenue Hotel. Motorcars, a carriage and a horse-drawn omnibus wait outside the hotel in 1906 -- Library of Congress. In 1913 as the city toughened its stand against “encroachments” upon public property, the hotel was forced to remove the impressive two-story portico. Architects Ford, Butler & Oliver designed a marquee and balcony over the main entrance to replace it. Six years later the employees of the hotel walked out on November 12, 1919. There was no general strike—they simply wanted to have fun. Notice was given to all guests that if they wanted “any ice water, newspapers, magazines, stationery, stamps, mail or anything else generally asked for the request must be got in by 7. P. M. today.” The bellboys and doormen, waiters and other staff were throwing their own ball. Six months later the newspaper confirmed the rumor. 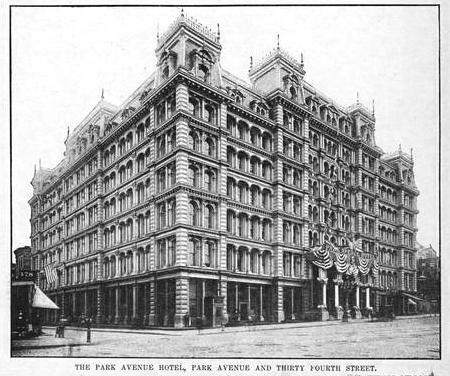 At the same time that it announced that William K. Vanderbilt’s mansion on Fifth Avenue and 52nd Street would be razed for a 20-story business building, it told of the 35-story office building that would replace the Park Avenue Hotel. Henry Mandel had purchased the property from the A. T. Stewart estate as part of a $10 million project. John Kellum’s colossal cast iron pile and Alexander Stewart’s lofty dream crashed to the ground before the end of the year. Yikes, what a beaut. And unknown to me. Thanks. Thanks for the great post ..this is quite interesting article..Got to know about the women's working hotel..